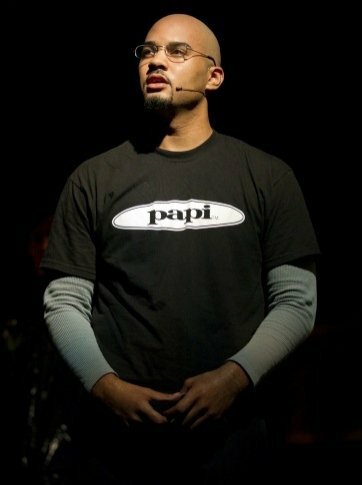 Bermuda actor Nicholas Christopher [pictured] and the cast of the Off-Broadway revival of” Rent” made a surprise appearance on today’s [Nov. 18] broadcast of “Live! With Regis and Kelly” to pay tribute to host Regis Philbin, who is departing the programme after 28 seasons. But instead of measuring love, the cast measured Mr. Philbin’s television career — 995,600 minutes. The usual lyrics are “Five hundred twenty-five thousand six hundred minutes” — or the number of minutes in a year. The rewritten lyrics commemorated Mr. Philbin’s roughly 16,500 hours on the air, counting his ABC talk show as well as multiple hours of “Who Wants to Be a Millionaire,” “Million Dollar Password” and “The Joey Bishop Show”. The song, known to a lot of people as “The Minutes Song,” has been a particular “Live!” favourite, with the cast of both the original Broadway musical and the film version of “Rent” coming on Mr. Philbin’s morning chat show to perform it in the past. The critically acclaimed ”Rent” revival, directed by original Tony-nominated director Michael Greif, officially opened August 11 at New World Stages. Mr. Christopher plays Tom Collins — a philosophical anarchist professor in Jonathan Larson’s rock musical based on Giacomo Puccini’s opera “La Bohème”. Described as “wry and confident” by one critic, the Bermudian was recently singled out as one of the stand-out actors in the show by on-line gossip maven Perez Hilton. The son of Hamilton Town Crier Ed Christopher, the Bermudian actor announced last week he was taking a short leave of absence from the show because of a back injury. But he was part of this morning’s ensemble whose performance reduced veteran talk show host Mr. Philbin to the verge of tears on the eve of his retirement. The young Bermudian, who studied at Boston Conservatory and New York’s Juilliard School, made his professional theatrical debut in the US earlier this year in the touring company of the Tony Award-winning Broadway musical “In The Heights” before being cast as Tom Collins in “Rent” — one of the hottest tickets in New York and perhaps the most critically acclaimed show to open in the city this year. Part-time Bermuda resident Michael Bloomberg also participated in the tribute to 80-year-old Mr. Philbin. The New York mayor presented Mr. Philbin with a key to the city, and suggested new jobs for the retiring Philbin including cabbie, New York Yankee, underwear model — and New York mayor, with images of the retiring TV host digitally inserted into appropriate photos. “You have been New York City’s biggest fan for 28 years and I just wanted to come and tell you New York feels the same way about you,” Mr. Bloomberg said, adding that the city enjoyed tourism business from people coming to the city for the show. With Rebecca Faulkenberry appearing down de road from Nick Christopher in “Spider-Man”, strikes me that Bermy is runnin’ t’ings on and off Broadway these days! Congratulations to both of you! Bermuda is proud of your tremendous achievements! Awesome to hear…never been interested in the broadway show experience but I am so impressed with the efforts of these two young Bermudians (Nick and Rebecca)that I will be making my first to NYC in 6 years to see them. I dont know either of them or their families, but I am pround of them and I will be taking my daughters with me so that they can see for themselves that as big as the world may seem and as small as Bermuda is…anything is possible…if you work hard at it and do not give up. Bermuda is definitely making its mark on the worldwide entertainment stage…besides Rebecca and Nicholas…let’s not forget Will Kempe who has done television (Charmed and Angel) as well as stage productions and Rafael Fuentes who, while not Bermudian, was educated for the better part of his formative years hear and is doing extremely well for himself in the infancy of his career. *here…not hear…after formative. Sorry, I got a bit enthused!!! While he’s there, Nick could teach Regis how to ride a bike!! This is truly fantastic……I agree Bermy’s have taken Broadway by storm. Brilliant. I am inviting REBECCA and NICHOLAS to record a duet for the upcoming John Lennon Tribute CD……to be released “worldwide” next June to coincide with the unveiling of the John Lennon Sculpture at the Masterworks Museum of Bermuda Art. There are some AMAZING artists taking part on this CD with both Local and International artists who have performed or lived in Bermuda. AH……we gotta keep the list a surprize !! Don’t forget we are having an evening at CHEWSTICK on December 17th for “BERMUDA VOICES” that we will select to be a part of an iconic John Lennon track. Bermuda needs to make our island a “TAX FREE zone for the arts” (like Ireland used to be), and really grow the artistic community here. With the plans for a Performing Arts Centre really taking shape and momentum Bermuda’s artistic/creative community looks set to soar. Let’s not forget Bermudian Drummer ANDY NEWMARK who has recorded with Sly & the family Stone, Carly Simon, Dave Gilmour, George Harrison, Bryan Ferry, John Lennon, Nils Lofgren, Eric Clapton…. Andy is helping to really make the upcoming John Lennon Trbute CD really something special….STAY TUNED ! Wow! 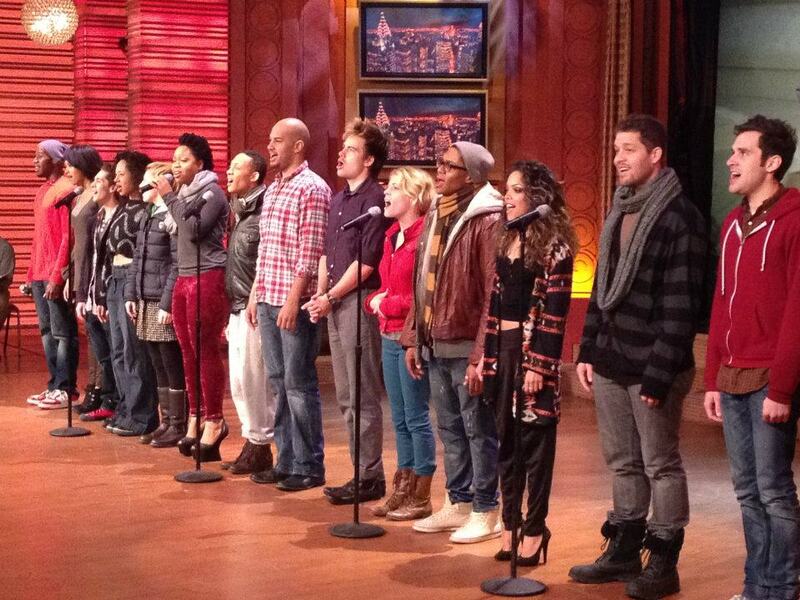 I’m absolutely inspired by Nicholas and the Rent cast singing 995,600 minutes to Regis. Thanks Bernews.